The best taxi in Thailand. Quiet but fast shipping, excellent driver. Car clean, nicely scented. Excellent driver, very safe and careful, would recommender to anyone. Super Sweet Lady! Great Driver!! Awesome price!!! And The Prettiest Taxi Driver I Have Ever Had!!!!!!!! 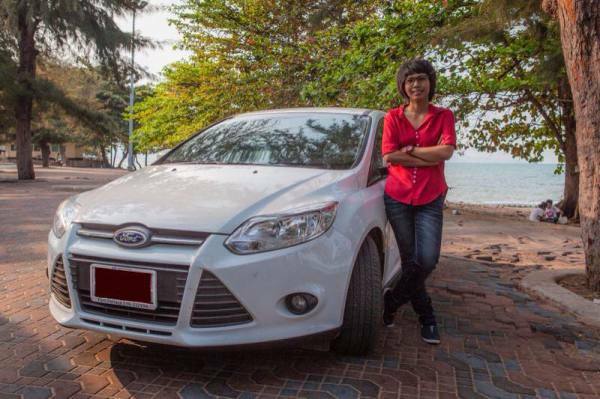 Booked my January 2016 flight yesterday, and booked Nam's taxi before I even looked for a hotel. It was more important to me that I get trusted transport arranged as soon as my flight is booked, rather than look for a hotel. The good news for me is that she is available for both journeys. I have mentioned this before on here but I will say it again I cannot recommend this young lady's taxi service highly enough. Nam was a friendly and comforting face after the 29 hour travel time with luggage checks, passport checks, security checks and customs checks. Just put the luggage in the trunk and sit back and relax; you're going to get where you're going safely, you can quit worrying, she's done this many time before. Same with the departure trip; she'll get you there comfortably, safely and on time for check-in. Car was spotless, even the trunk, and she had cold bottled water. Dehydration can sneak up on you. The fare was more than reasonable and I will be making arrangements for Nam's transportation help during future trips. If you're like me, you try to learn a bit about what works and what doesn't on each trip. Nam's got this covered, so I can focus on other things. The Hideaway Guest House and bar is a brand new Pattaya Guest House, situated in the Soi Buakhow area. It is within walking distance of all of Pattaya's famous nightlife such as Walking Street, Soi Buakhow, LK Metro, 2nd and 3rd Roads. A good friend of mine, Geoff Carter has his own YouTube channel where he publishes many videos of Pattaya and his Travels around Thailand. Click on the link and pay his channel a visit his videos are informative and a lot of fun to watch. 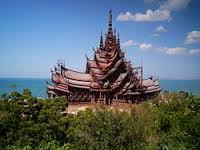 The Sanctuary of Truth is a gigantic wooden construction which covers the area of more than two rai. The top point of the building is about 105 meters high. The building was constructed using traditional skills and every square inch of the building is covered with carved wooden sculptures.